The aesthetic value of a bathroom area in a home or resort is so much determined by the amenities and decorations that can make it more appealing to behold. For those who have spacious bathroom area it is recommended to put some bathroom furniture to bring certain impression that you might desire. 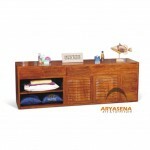 This wood furniture is not just presenting utility aspects, but also artistic aspects. Our bathroom wooden furniture is assured to be long lasting, tough, and durable, as a result of meticulous craftsmanship works and flawless detailing. If our bathroom furniture collections appeal to you, than look no further than here.